Trafford Publishing released Rev. Mark Peske’s debut non-fiction book From Nightmares to Sweet Dreams: Letting the Presence of Christ Transform our Worst Memories this July in an act that highlights the potential in the oft-maligned vanity publishing industry, the ability of ‘outsiders’ with next to no chance to break through into traditional publishing venues to give their dreams an chance. In full disclosure I have known the author, a Christian missionary to the Cass Lake Ojibwa, for eleven years. That is the risk of vanity presses. If I had not known the author personally I would have missed out on this excellent resource of hope and healing for those who face emotional pain and traumatic memories. Mark Peske is a seminary-trained, ordained minister in the Lutheran Church, Missouri Synod, but in person he attributes most of his knowledge to life experience on the job. This attitude dominates Mark’s work with a first-person narrative format. Mark does not lecture. There are no outlines, flowcharts, or Bible studies in this book. Mark conveys the information gathered in many years’ work with the oral-tradition oriented Ojibwa in like manner. The book is organized in mosaic fashion, stories of a slightly different color blend together to depict a single image: The pain of past memories, whether they are wounds done to us by others and a hard world, or self-inflicted wounds, continue to effect us until they are healed. Rev. Peske does not argue that they are healed by the presence of Christ in the memory. He relates it happening, again and again. This is an excellent approach to a relativistic and post-colonial culture, since Mark keeps a gentle, persistent flow of narrative to the Christian savior. 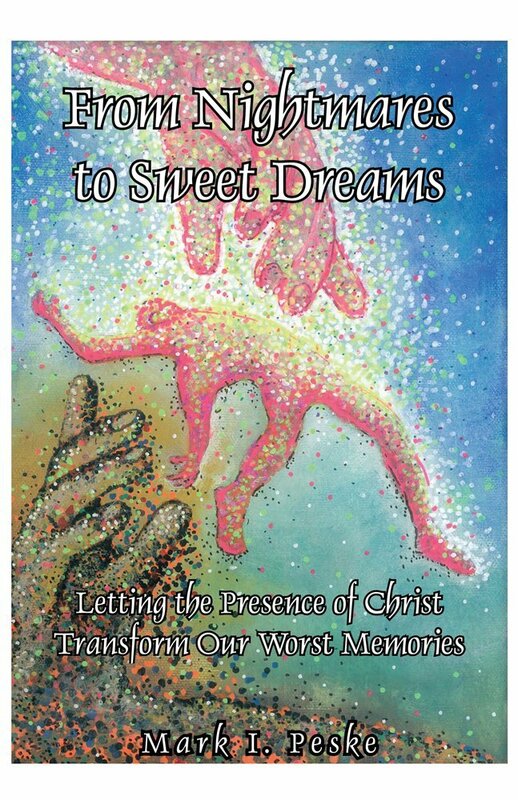 From Nightmares to Sweet Dreams: Letting the Presence of Christ Transform our Worst Memories is not an easy read in many ways. The traumatic memories that Peske recounts in the book run the gamut from the common (a little girl’s fear after a scary movie, a parent’s realization that they cannot always protect their children) to the terrible (physical and sexual assault, arson, and even killing). It is telling that Peske makes no effort to differentiate. His book presents each trauma as its own issue, worthy of attention, compassion, and healing all on its own. The variety proves to be a valuable choice. The reader with a profound trauma is not presented with a Pollyanna Christianity Lite unequal to their real pain. The reader without a great trauma is not presented with an Emergency Room Gospel that cannot reach down to their own private daily worries. There is a tile for all readers in Mark Peske’s mosaic. When Rev. Peske does describe his thesis directly, he does so in a humble and narrative fashion. The author discovers the power of this truth, he does not invent it or give in to the pitfall of self-congratulation. Mark presents himself as a fellow-sufferer. At least one anecdote is about one of his children, and another describes his own fears for his sons. In this age of high-powered, high-energy preachers who make headlines and fortunes, Mark Peske presents an imitator of Christ the High Priest as described in Hebrews, who comes alongside with compassion. The book’s thesis is simply stated: Jesus was present when you were hurt or afraid. He is present now. He loves you and you will never be alone no matter what pain, shame, or fear comes your way. Story after story this maxim of Christian theology provides the sufferers with comfort, and leaves the reader with the same comfort. Mark Peske provides us with a vision of Christ present in the pain of others, over and over again, and by the last page one finds comfort in the idea that the God whose very presence has soothed so much pain, healed those wounds, is with us all. If it weren’t for a vanity press, I would not have this chance to recommend this novel to any and all. It is available in hardcover, paperback, and Kindle e-book.